... and an interpreter who made a tremendous impact on the world. He passed away yesterday in New Brunswick, New Jersey. For anyone who ever had doubts about the important role interpreters play in society at large, here is a story worth noting. Carol Hidalgo, an interpreter at the Mayo Health System's Austin Medical Center noticed a pattern among patients for whom she was interpreting described the same symptoms and happened to work at the same pork processing facility. Eventually, a partnership was formed that included the plant, Austin Medical Center, Mayo Clinic, the state health department and the CDC, who are continuing to prevent against further outbreaks of the disease. 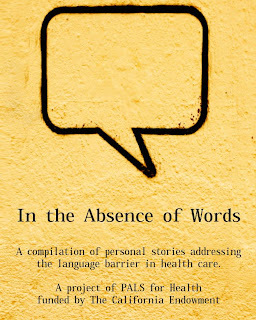 A new compilation of stories about the impact of interpreting on access health care services has been published by PALS for Health, funded by the California Endowment. of the doctor’s questions and thoroughly explain what I needed to know about my illness. I finally gained an understanding of my medical condition and progress, the treatment plan, and what I needed to be cautious about. This crucial understanding helped dispel my fears and drastically strengthened my faith in my own ability to recover and conquer the disease." "I wasn’t sure if I would be able to express myself, what I was going through, and whether I would be able to receive the care I needed. But my anxiety quickly turned into joy and hope when I learned that the staff had arranged for a professional interpreter to assist me. [...] Many of us, as patients, don’t know that we are entitled to interpretation services when we go to the doctor. Some providers and administrators may know that they need to provide this service, and yet they use untrained staff or anyone else to interpret matters about health that can be about life and death. The solution to these problems, I believe, is to have more training for medical interpreters and to educate the public as well as the providers." "What I find most rewarding as a health care interpreter is seeing the look of relief on people’s faces when they know they are able to communicate and understand everything during the session with their doctor. They leave their appointment feeling assured that no question is left unanswered." What does it take to be an interpreter? Listen to this short Mp3 to hear the answer in a wonderful little gem of a radio program devoted to language. "Talkin' About Talk is a collection of fascinating insights into language: a series of 52 little essays--conversational in tone, light and anecdotal in style--that encourage language study and invite listeners to look further into the subject of each essay. The series, part of the 2005: The Year of Languages celebration, was co-sponsored by the College of Charleston (SC) and the National Museum of Language. The material was written by a wide-ranging group of experts, including some of the most well-known linguists in America. The architect and voice of Talkin' about Talk is Dr. Rick Rickerson, professor Emeritus at the College of Charleston. Brief biographies of the authors can be found on the College of Charleston website: www.cofc.edu/linguist." Click here to access all 52 episodes of the program. In a previous post, I shared a video clip about interpreting that was very popular. Here is another funny look at the difficult work of interpreting, courtesy of Candid Camera (UK) via YouTube. This is a perfect example of why professional interpreters, who follow codes of ethics and standards of practice, are a necessity. Ever since the deadline for submissions closed on February 8th, I've been savoring the many wonderful stories that have been received for the From Our Lips to Your Ears project. I am proud to share that the stories received so far include interpreters from 5 different continents, more than 20 different language pairs, and settings that are extremely diverse - including many of the settings that have been featured in some way in postings here. Whether it's an interpreter rendering words to the delight of professional soccer fans, an interpreter pronouncing the words, "it's a girl!" to new parents in the maternity ward, or an interpreter helping facilitate a spacewalk, these stories are sure to evoke much emotion, pique much interest, and shed tremendous light on the important work of interpreters. Many of you have written to request an extension of the deadline, and since I had already extended it once by request, I decided not to extend it a second time, especially given the amount of material received. However, if you do have a story you'd love to share, don't hesitate to contact me. Depending on the type of story, there might be a fit. If not, it might work for a second volume in a From Our Lips to Your Ears series, which has been suggested to me by quite a few of you! Thanks for all your supportive feedback, calls and emails! I will be back soon with more updates, albeit less frequently while I am in the editing stage of this project.